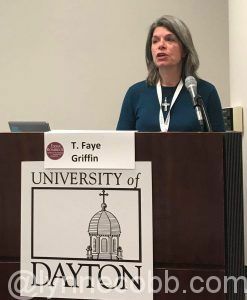 Traveling solo to the conference – and not knowing anyone there in real-life – was “brave” and out of my comfort zone. I was proud of my resolutions so far! Yay, me! The evening of the workshop’s kick-off I mixed and mingled and met new friends and laughed until I cried. 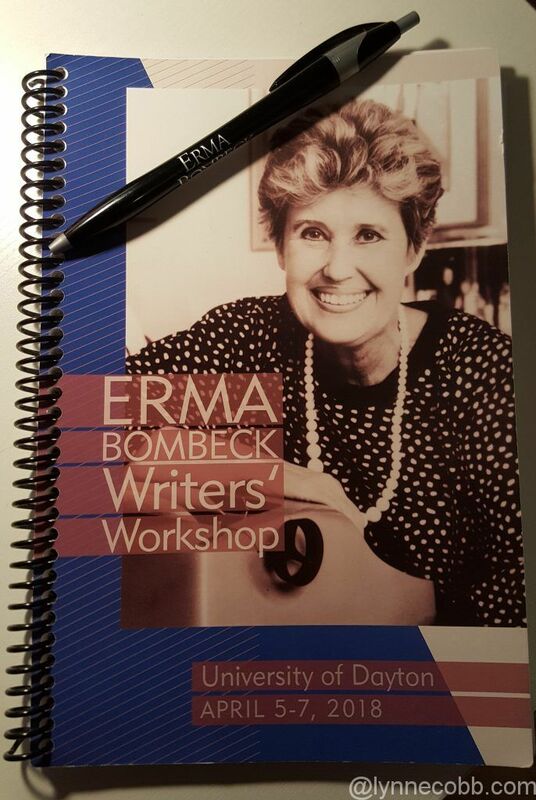 My handy-dandy Erma Bombeck notebook and pen. Friday morning, I grabbed my handy-dandy note book and set-off to sessions that were fun and inspiring and motivating. In fact, I even stood up at a podium and read a short essay in front a group of fellow writers. My friend and mentor, Elaine, snapped a photo and congratulated me and said, “Now you can add “Speaker at an International Conference” to your bio! Reading my essay. Photo courtesy of Elaine Ambrose. I was gaining confidence and pushing myself way, way, way out of my comfort zone. If you’re going dream, dream big. Saturday’s workshops were fantastic, too. I didn’t want the conference to end, but I also couldn’t wait for it to end so I could hole myself up and write, write, write. The last session on Saturday was “Pitchapalooza – American Idol for Books.” This event allows 20, randomly-picked writers to get up and, in one minute, pitch their book idea to a panel of judges. One lucky winner receives an introduction to an agent or publisher, whichever is appropriate to their book. As much as I wanted to attend, I told a few people I would probably just skip this and take a nap, because I wanted to watch the stand-up comedians perform later in the evening. My new friends said I should attend, because the panel’s critiques were helpful for all writers. But, even if I did, I wasn’t prepared. I didn’t have anything written down, and three pitch ideas swirled in my head. What were the odds of me being called, anyway? There were a couple hundred names in a hat. It was my first time here. I settled in the back of the room, and my “newbie” pals joined me. I mentioned I was only going to be here for 20-30 minutes. We chatted about what we would say, what were our odds, and listened to some very talented people give some very good pitches. The feedback was great. Applause was happening, and excitement was filling the room. What. Wait… did they really call my name? I had a fraction of a second to decide what to do. Bow out gracefully, and say I wasn’t prepared. Or, take a once-in-a-lifetime chance. I didn’t then, but I know now. Carpe diem. Seize the moment. I have tried to live that for the past few years. And I did. I could talk for a minute. It’s not that long. Shaking like a leaf, I waited on-deck, settling on one of the three pitches I’d been mulling over in my head. I paced, I breathed and I waited my turn, happy with what I chose, and ready to pitch. There I was. At the podium. In front of hundreds of people. My prior public speaking skills kicked in. I took a breath. I exhaled slowly. I made eye contact with the audience and the panel. I breathed again, and I was off and running. I was nervous, but I kept driving on. This was exciting! My book idea! I am telling a group of amazing talent my idea! I was smiling! This was pretty cool! The panel looked interested! And then it happened. In the middle of my pitch, at the end of one sentence, I took a breath and opened my mouth for the next. My mind did a complete dump. I couldn’t remember what I had just said. I couldn’t remember what I was going to say next. I remember that I apologized, stepped away, and said to give my pitch spot to someone else. In total humiliation, I exited stage left. I mean right. Oh hell, I don’t remember. I just knew I had to get out of there. I had blown my chance. Again, I repeat, do you know how many thoughts your brain produces in a nano-second? I was thinking that this is how I will die. And how do singers and actors and performers do this? And how do I bow out gracefully? And how will I ever show my face again, and is there a flight to go home NOW???? I thought about all of my family and friends and readers who were so excited for me – the people who were rooting for me and who were proud of me for attending EBWW. No, that wasn’t a voice in my head. Calm as could be, Liz, the next author on deck, asked if I was okay. Was I going to faint? “Lynne, go back up. They want to talk to you.” And she gently turned me around, and I was back at the podium. Horrified. The panel and the audience were good and gracious and kind. I wasn’t out of the running. 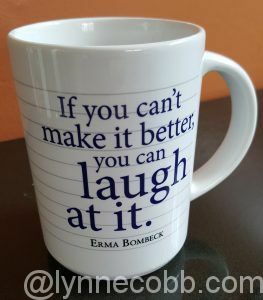 In another bit of irony, I chose this mug out of the ones available. Words for me to live by. Everyone gets 15 minutes of fame. Thanking them, I left the podium, and Liz went on to pitch her book. I wish I could tell you how fabulous she did, but I was too busy fanning myself and blotting the excessive sweat that escaped from pores on body that I didn’t even know existed. I stayed through the pitches, because I wanted to see who won. I didn’t. Well, not in that way. I didn’t get the publisher deal, the advancement of riches, the promises of fame and fortune and everything that goes with it… that would let me quit my day job and write my novel. But what I won was the love and support and comfort of my new friends, waiting with open arms at my table. I like to think that I took one for the team. That because my train of thought derailed and jumped the track – and every other train-ism metaphor you can think of that applies here – no one else went through hell on stage. I can say my fear of dying is now number one, because I didn’t die via public speaking under the worst, possible, embarrassing circumstances. I was truly thankful the for incredible number of people that came up to me afterward and encouraged me, who said that they could never have done what I did. One even said, “You are brave.” My word of the year. Of course, I had just wanted to run, and the only thing that stopped me are knees that won’t cooperate, because if I could have, I would have. But had I run, I would have missed so much. Yes, I was embarrassed, but I didn’t die from it. Yes, it was awkward and I was perspiring like a pig. But, I got some great feedback. The panel liked my book idea. They said to go for it, that they would want to read it. I would have missed that had I left. I would have missed so much if I had sat in my chair, pretending I wasn’t me. “Lynne Cobb? Where is she? She missed her chance.” I could attend the next 10 conferences and never be called again. And if you are wondering who won Pitchapalooza… it was Liz. I wish I hadn’t been so rattled, as I would have loved to have heard her pitch. All of the pitches were good. But I was rooting for her, because without her immediate support, I would have run. And then tripped. And been on the next flight out of Dayton. Are you afraid of speaking in public? Do you have an embarrassing moment but lived through it? Feel free to leave a comment below. If you like this blog post, feel free to share using the social buttons. Sign-up for emails with new posts delivered directly to your inbox! Yay Lynne! I was so proud of you. You went way out of your comfort zone and lived to tell the tale. I’ll be happy to read your book. The judges were very gracious with everyone, and the audience so supportive. I was so impressed. I, too, wasn’t really clear whether I had just expressed an interest in Pitchapalooza or had actually signed up, and instead of having a pitch ready just in case, spent Wednesday, Thursday and Friday night staying up late watching crap on TV. So who’s name is called around fourth? Yours truly. I muddled through, and then was grateful to see that I wasn’t the only one who was flying by the seat of her pants. I took so much from that session, so even my bumbling was beneficial. And man, my pitch was completely perfected on my ride home. Oh, for a time machine! Thanks for sharing. You captured the feel perfectly! Lynne, a perfect recapturing with a meaningful takeaway. Thanks for inspiring me! Thank you, Joni. It was wonderful to meet you!! Lynne – what an inspiring posting. I can really feel your anxiety regarding public speaking. That has always been one of my weaknesses, but has gotten better by “forcing” myself to speak in front of church gatherings. Aside from your little stumble, it sounds like you really learned a lot and met some new lifelong friends that are invaluable. I’m sure you came home very glad that you went. Thank you for sharing. It helps all of us to know that we can overcome our fears. I really like your quote of Jerry Seinfeld, which I think really sums up public speaking. Looking forward to your future posts on tips you learned at the workshop. Way to Go. You did great! Thank you, Bob! Other than the stumble, the workshop was perfect. I am so glad I went. I hope my “I survived” post will encourage others. Carpe diem! I love this, and I love you for going for it, and sticking with it. I cheered for you that day because I was so impressed. I want to read your book, too, so get to it, brave soul! Amy, thank you!!! And I am!!! You’ve inspired the rest of us! Everyone had your back, as you know. Good on you for going ahead! So nice to meet you, Lynne-with-an-E! So true, Risa! If you are going to have a moment, EBWW is the place to have it! It was great to meet you. See you in 2020! That’s the wonderful thing about Erma and Ermites. We are all truly rooting for each other and want each other to succeed. There’s nothing to be embarrassed about because we all understand how daunting this thing we’re trying to do is. Kudos to you for having the courage to go up there and go for it, Lynne! I was there. You were fine and very funny. You can write and you can speak in public! Don’t be embarrassed! You did great! Good on you for going to the conference in the first place, and for standing up to make a pitch. I don’t know of one person (let alone another writer) who hasn’t done something similar at one time or another!Cheers! Thank you, Cindy! It was definitely an experience in every sense of the word. The conference was absolutely amazing and life-changing! I was delighted to meet you at Erma, Lynne. And as I said on the bus back to the hotel, you didn’t stammer. Not even once. Thank you, Kelly! 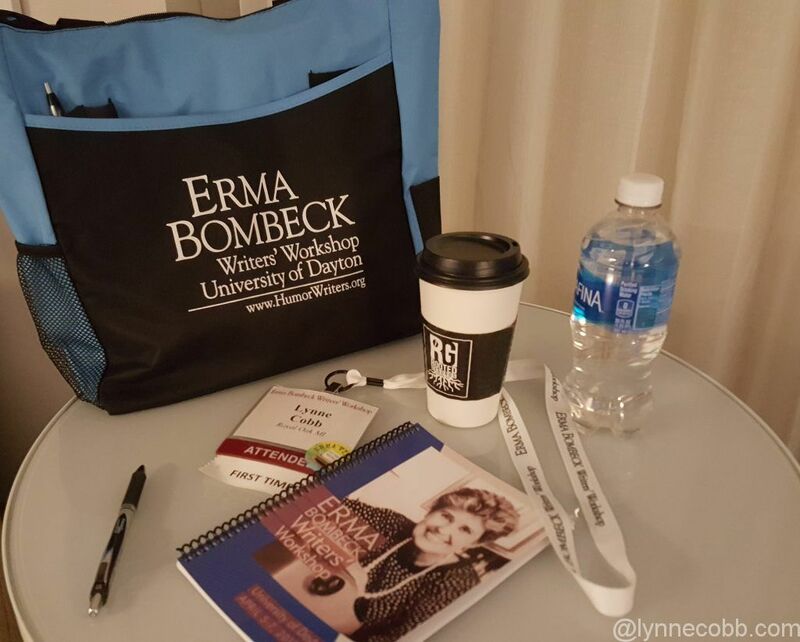 EBWW was wonderful in so many ways, especially meeting you and other amazing writers! Next PostNext Do your knees say no?